You turn it on/off here: Configuration | General | Menus, Mouse, Safety | Safety Belts | Show drag status box. That’s all you need to know. The rest is plug and play as they used to say many moons ago. Nothing to learn, nothing to know. It just works in a natural self-explaining way in full harmony with the universe. 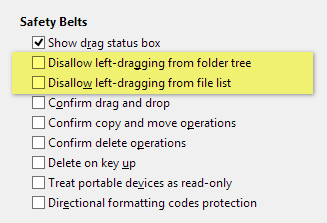 The Drag Status Box moves with the mouse while dragging 5 items from the file list to the folder tree. 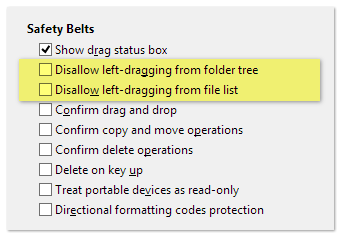 The Drag Status Box turns pale-green with right-mouse dragging. This only works when toolbar button captions are turned on. Do it here: Tools | Customize Toolbar (Ctrl+Shift+F9), then Options | Show Button Captions. Tip: If you happen to lack a wheel on your mouse you still can alter the toolbar font size, of course, and also the font itself. Go here: Configuration | Colors and Styles | Fonts | Toolbar.